… and so are our plates! I decided to try making something I had been dreaming of for quite a while, but didn’t know if it would come out ok. I got some homemade phyllo leaves out of my freezer* hoping I could substitute them for the flaky pastry traditionally used in this recipe. I folded them, taking care to add olive oil and a little sugar at each folding step, and stuffed them with apple slices and nut butter. The result was a tasty and pretty dessert ! So I made it again and took photos to share with my dear neighbors ! * If you have never tried making my gluten-free phyllo leaves, you need to know that since I first came up with the recipe, I have found (and shared) some tricks that have made my life easier. The best one is that I can now freeze these leaves and use them as needed. They are so thin that you can just get them out of the freezer on the spur of the moment. Now I make them while attending to other things whenever I end up with an unused egg white. And if you think about it, making real flaky pastry dough (« pâte feuilletée »), even with wheat flour, is a lot trickier and time-consuming. Hence my motivation for making my own gluten-free phyllo leaves. – 5 gluten-free teff flour phyllo leaves (recipe here) OR regular store-bought phyllo leaves, provided you are not gluten-intolerant. Forget about using rice sheets here, there will dry up while baking and you will be sorely disappointed ! All quantities are really approximate as it all depends on the size of your phyllo leaves. Mine are 20 to 22 cm (8 inches, give or take) in diameter. 1. Wash and cut the apple(s) in half and remove its core. Cut into regular thin slices and microwave in several batches for 50 seconds to soften. The slices need space to breathe! 2. Cut phyllo leaves in halves. Take one half and place it on a flat surface, circular side top and diameter close to you. Brush lightly with olive oil and sprinkle lightly with sugar if desired. 3. Fold top over bottom as shown in picture into a rectangle-like shape. Again, brush with oil and sprinkle with sugar. 4. Place a few apple slices over top half of your rectangle, slightly overlapping. Do not crowd the apple slices. I use about six per rose. Using too many slices would make the next step difficult and result in breaking the dough. The slices should come a little higher than the top of the dough. 5. 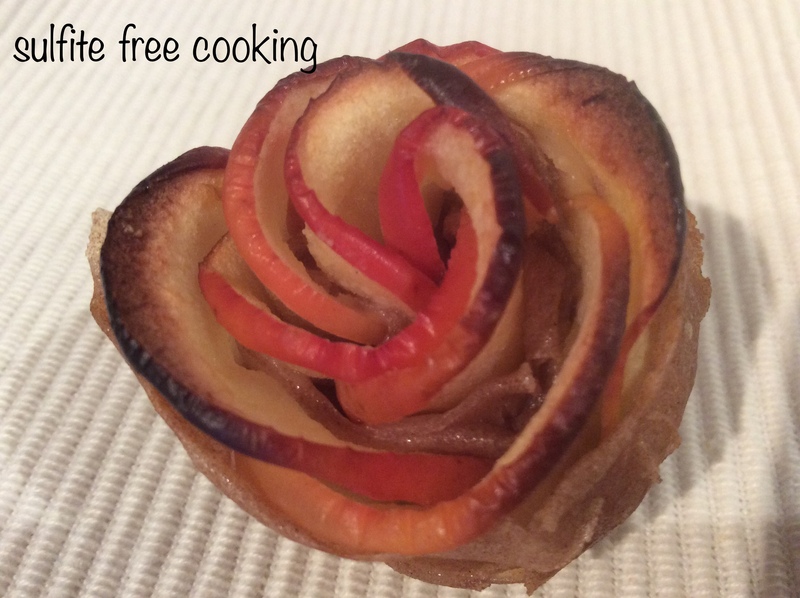 Fold the bottom part up over the apples, then roll gently (and not too tight) to form a rose. Secure with baking thread and place in a ramekin. Repeat steps 1 through 5 until all your roses are ready, placing about three roses per ramekin. 6. Bake the roses inside lined ramekins for about 45 minutes. Check the baking towards the end and cover with foil or greaseproof paper to prevent burning if necessary. You don’t want them to burn but you do want the dough to be very crunchy. 2. Lay one phyllo leaf on a flat surface. Brush lightly with olive oil and sprinkle lightly with sugar if desired. 3. Fold the leaf in three by bringing about one third of the top towards you and the bottom third over it. Top and bottom parts will overlap. Repeat oil (and sugar) operation over top half and spread a little nut butter over bottom half. 4. Place a few apple slices over top half of your rectangle, slightly overlapping. Do not crowd the apple slices. I use about six per rose. Using too many slices would make the next step difficult and result in breaking the dough. The slices should come a little higher than the top of the dough. Fold the nut bettered part up over the apples. 5. Roll the resulting rectangle to form a rose. Secure with baking thread. Repeat steps 1 through 5 until all your roses are ready. 6. Bake the roses inside lined ramekins for about 45 minutes. Check the baking towards the end and cover with foil or greaseproof paper to prevent burning if necessary. I almost forgot to cover mine ! You don’t want them to burn but you do want the dough to be very crunchy. Dear neighbors, I wish you all a nice weekend and a glorious spring ! These are simply spectacular! Thank you, Joelle! Thank you Dolly! It is safer to have me in the kitchen baking apple roses than in the garden tending to the real ones… Just ask my husband: I am well-known for mistaking young seedlings just beginning to sprout for weeds to be pulled out! Thank you 😊. The blue sky was yesterday, nothing but gray today, and colder too! Over here no fruit tree is safe until after May 13; gardeners are weary of what they call “les saints de glace” (ice saints? ), three days (May 11-12-13) when it usually gets colder and we sometimes get frost, which kills all buds. It’s better if spring doesn’t start too early! Looks yummy. I’ll have to try your gluten free phyllo leaves recipe. Thank you. Let me know if you make the phyllo leaves, and if you have any problems with my recipe. I couldn’t do without them now. They’re really pretty. I wish I had the dexterity to make something so intricate. They must be delicious, neighbour. I always enjoy seeing what you’ll make next. Wonderful! I also envy you your fruit tree. Thank you, neighbor! There is no reason why you couldn’t achieve the same result, honestly. Let me tell you about our peach tree. Once upon a time, there was an organic peach pit that somehow liked the soil where it had been thrown away (spat out, most likely!) and decided to grow. Not a very convenient spot, right next to our back stairs, but we left it anyway. We have never treated it, and depending on the year, the weather and so on, we get decent peaches… or not! Two years ago it gave a nice crop even though some of the peaches were spoiled from the inside. Last year was too dry and we got close to nothing. By the way, I forgot to tell you that shallots / shallats 😉are very tasty. You should like them. We have a similar tree in our garden. It just popped up one day, it as these spherical clusters of white flowers. It’s called a snowball tree and it must have been seeded when some bird flew over. I’d rather it flew over with a fruit seed, but you make do with what you have. Well, when I harvest them I’ll have to find a worthwhile use for them!